We are currently recruiting for a Conference & Banqueting Manager at The Gailes Hotel, a great opportunity to play a key role within one of Ayrshire's leading hotels. The Gailes Hotel is located on Marine Drive in Irvine. Also in Irvine, we are recruiting for a Duty Manager at Si! Bar:Restaurant plus Front of House team at this popular bar and restaurant. 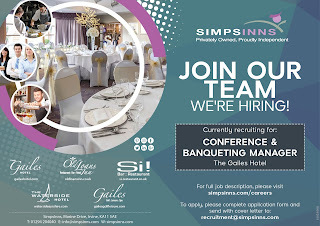 Take a closer look at https://www.simpsinns.com/en/careers/ where you will get full details and how to apply.